Well, the time has come to say goodbye to Yangsan, our home in South Korea since March 24th. And now the real backpacking begins. Three-month stays in comfortable houses are a thing of the past for us. From now on, my wife, our baby and I will be moving about much more frequently and relying on one big backpack, two daypacks and a baby carrier. For a lot of parents, the above probably sounds like a nightmare. It’s difficult just to go grocery shopping with an 18-month-old toddler. What kind of crazy person would want to go backpacking with one? It’s a fair question, and I’m entirely open to the possibility that we are indeed nuts. I’ll be honest and let you know that it all does seem rather daunting now that we’re only nine or ten hours away from our train trip to Seoul and just two days away from our flight to our next country – and the beginning of our “for real” backpacking tour. I’m also really excited, though. Most of the best times of my life have come while living out of a backpack and exploring foreign countries. I’ve never brought a baby along for the ride before, but our little guy is pretty resilient and seems to really enjoy new places, people and things. I have a feeling he’s going to be an excellent traveller. 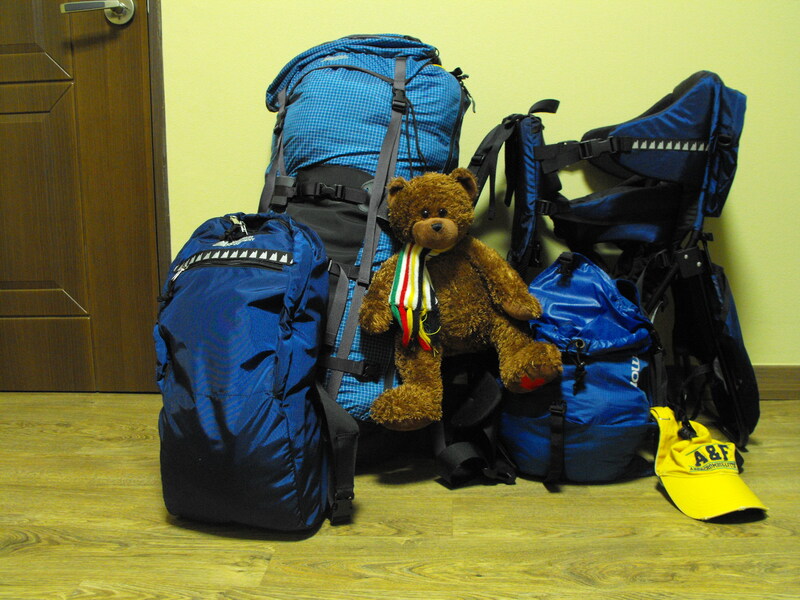 We've "simplified" our lives to this: a travel backpack, two daypacks, a baby carrier and Ian's teddy, Hudson Bear. That’s not to say there won’t be difficulties. Of course there will be. There always are, but it’s the difficulties that give travelling a lot of its flavor. In fact, some of the hardest times I’ve had backpacking are some of my favorite memories. The weekend I was homeless in Munich, visiting a war zone in the former Yugoslavia, a broken-down car in the middle of the Australian Outback – these are all experiences which I am deeply grateful to have had. The first two profoundly affected my life. There are also all the other experiences which go along with travelling: the amazing people you meet, the extraordinary art you see, and all the new cultures you get to immerse yourself in and learn about. This is what my wife and I really want for our son. They say the first four years of life are the most important, and we’re operating on the theory that giving him such a stimulating start to life can only be a good thing. Or maybe we’re just crazy. Who knows? We’re about to find out.